‘The Palestinian people deserve nothing less than their rights as guaranteed under international law,’ said Bishop George Browning, APAN President. APAN’s annual dinner in Melbourne was a wonderful success – with hundreds of people gathering to support Palestinian rights. A variety of organisations hosted stalls, Bryan Dawe entertained the group, and an auction were people were incredibly generous. Thousands of dollars were raised for APAN’s work into the future. Thanks to all who supported the event! Read more and see photos. The APAN Annual General Meeting, held 25 October 2015, endorsed a “policy of boycotts, divestment and sanctions (BDS) of Israeli and international institutions complicit in violations of human rights and international law in Israel and Palestine.” See our Media Release here. Violence in the early days of October have soared. The UN Secretary General expressed his alarm at deadly incidents and the Palestinian Red Crescent Society called a state of emergency following 14 attacks on their ambulances by Israeli forces and settlers. As of the 14/10, 29 Palestinians have been killed, all by Israeli forces, including many teenagers, and a bombing attack in Gaza killed a pregnant woman and her toddler. Nearly two thousand Palestinians have been reported injured, mostly by Israeli forces, but also from a stabbing in the Israeli town of Dimona. There have been 7 Israelis killed, and over 67 injured by attacks by Palestinians. APAN member and former Australian Ambassador to Israel Peter Rodgers had an Opinion Piece published in The Australian on the 9/10/15, stating that “Bereft of any other vision Israel’s only goal appears to be conflict “management””. 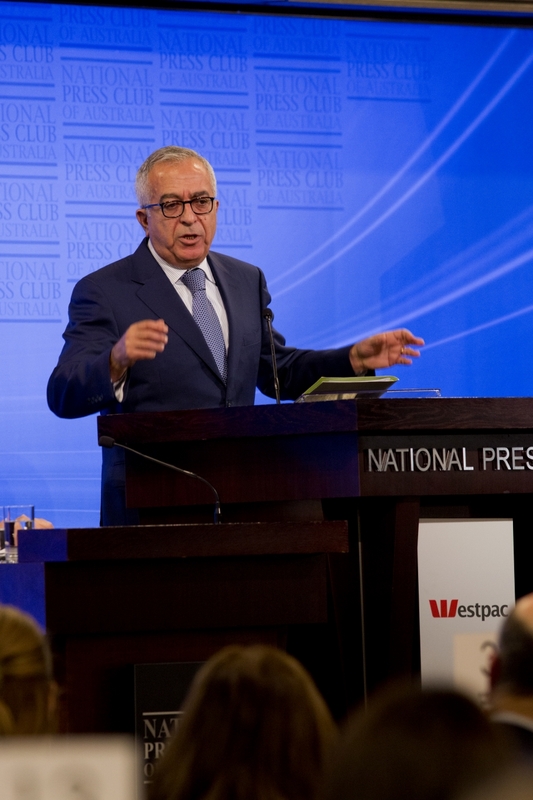 In September, the former Palestinian Prime Minister, Dr Salam Fayyad visited Australia to deliver the Edward Said Memorial Lecture. While he was in Australia he also met with political leaders, and addressed the National Press Club(link to listen). Dr Fayyad stated that every round of ‘peace talks’ have brought a deterioration in the terms of reference, and the international community must ensure that Palestinian rights are the key starting point, not what Israel may be willing to agree to. See more about Dr Fayyad’s visit, including more photos. The strong Palestinian community of Susiya are in the fight of their lives to save their homes from demolition. Watch it here. Susiya is a village in the Occupied Palestinian territories which has faced severe restrictions imposed by Israeli authorities for years. And now the people of Susiya could soon see their village demolished by the same Israeli authorities. Everything could go: homes, livelihoods, land. APAN has joined with Action Aid Australia to call on the Foreign Minister to join her international counterparts, including the USA, to ask Israel not to demolish Susiya. ASPIRE, a Melbourne- based organisation, has released a report focusing on the situation of Palestinian refugees who have been living in Syria. The report includes calls on action from Australia and UN bodies to take practical steps to protect and support these refugees. Read more. APAN welcomes change in ALP policy on Palestine. The resolution passed at the ALP National Conference in July was a positive step forward towards a balanced foreign policy position. APAN would have hoped it could have been stronger and called for immediate recognition of Palestine. Read our press release. watch Wendy Turner’s speech in seconding motion. APAN joins other NGO’s and UN bodies calling for urgent action to respond to the catastrophic humanitarian situation in the Yarmouk refugee camp where Palestinian refugees are besieged by violence and unable to gain aid or even water. Titled Netanyahu is consistent in his deception, Bishop Browning’s piece details why Netanyahu’s pre-election promises of more settlements and no Palestinian State should not be a surprise. Read article. Sonja Karkar from Australians for Palestine, writes a moving piece detailing the former Prime Minister’s strong support for Palestine over a number of years. They include a quote from his 2011 article “There is an Israeli lobby that governments are not prepared to offend” and that if Israel and the US persist in dividing the Palestinians into hostile camps between Fatah and Hamas, “Israel will lose more and more friends and will place its own future in danger.” Read article. In the March 2015 sitting of federal Parliament, two parliamentarians spoke up for Palestine. Senator Nick Xenophon called for urgent assistance for Gaza, including the end to the Israeli blockade. Melissa Parke MP highlighted the election of Netanyahu who promised no Palestinian State and called on Australia to recognise Palestine. In their condolence speeches to the Rt Hon Malcolm Fraser, both Senator Xenophon and Ms Parke MP recognised his commitment to Palestine. who called for an immediate Australian recognition of a Palestinian State, and by Craig Laundy MP(Liberal) who stated that he is frustrated that parliamentarians appear to be hiding behind rhetoric of a two state solution. Further speeches in support were given by Jill Hall MP(Labor) and Melissa Parke MP(Labor) and Russell Broadbent MP(Liberal). Following this Senator Urquhart(Labor) also made a speech calling on Australia to recognise Palestine, and Senator Milne(Greens) tabled a Senate motion indicating that the Greens support full and immediate recognition of Palestinian statehood.